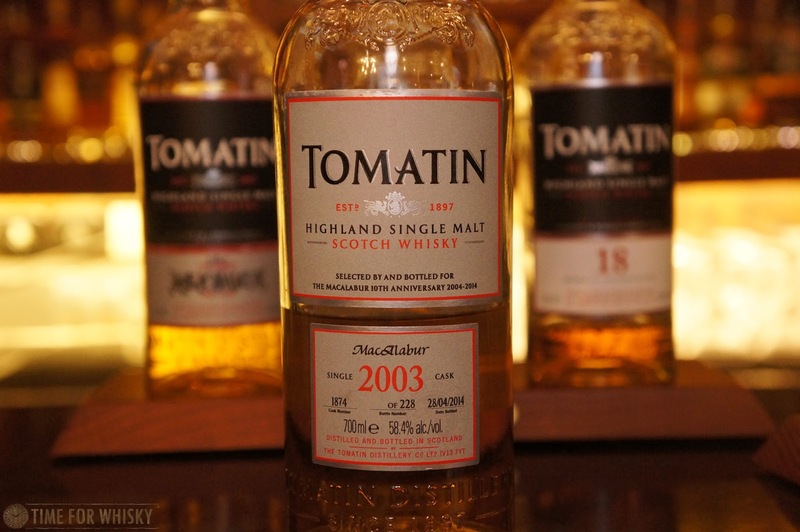 Tomatin was one of those distilleries we'd tried here and there, usually at various whisky festivals, but never actually sat down and taken the time to really taste one (let alone six) of their releases. Arriving at the heritage Whisky@Stables bar at Hullet House (on a significantly less muggy day than last time!) 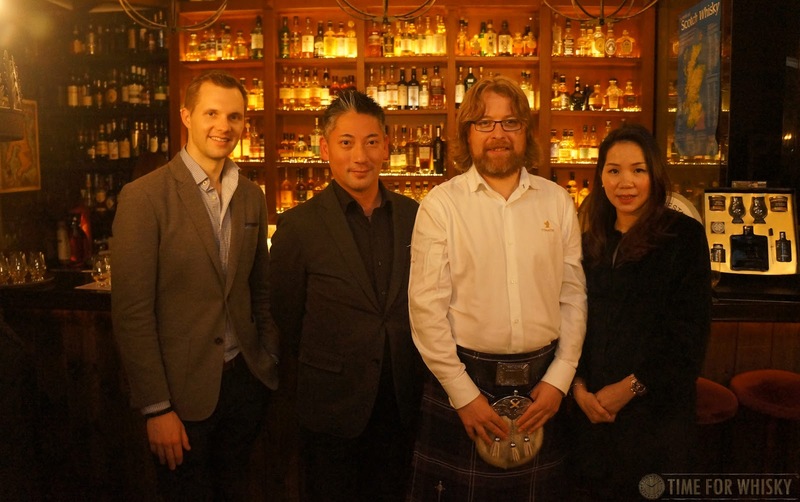 we chatted with Graham, who we learned was on a mammoth trip taking in HK and Japan (with barely a single day between tastings) and local Tomatin representative / good mate Eddie Nara. From its earlier days as a popular malt for blenders, to 1984 when the distillery went out of business, to today where we see Tomatin as a popular Highland single malt (particularly in Asia), Graham took us on a brief journey of the distillery (injecting plenty of humour along the way) before we delved into the six drams in front of us. An interesting NAS made up of 85% ex-Bourbon barrels and 15% virgin oak. Nose: Banana bread, lemon sorbet, sweet vanilla. Palate: Zingy and citrusy. Some custard. Very sweet. Lemon sherbert and some whole limes. Finish: Short to medium length, lots of citrus - key lime pie. Finished in 1st fill Oloroso casks. Nose: Blackberries and a slight nuttiness. Palate: Light overall, but more mouthfeel than the NAS. Some more nuts, orange, spice. Finish: Medium length, with some residual sherry notes - Brazil nuts and sherry-soaked Christmas pudding. Rating (on my very non-scientific scale): 90/100. Easy drinking and quite "sessionable". ABV feels spot on for the style of whisky (light and approachable). Nose: Rich red berries (strawberries, raspberries mostly), cherries and burnt/caramelised sugar. Palate: Initially a little thin, but then come some rich notes of toffee, caramel, cranberries, tangerine and strawberry. Fruity, but in a different way to the Legacy. Finish: Medium to long in length. Butterscotch, toffee and a slight hint of smoke. Nose: Flinty, whole oranges. Clearly Sherried. Palate: Vibrant, hints of spice, nutmeg, whole oranges again, and then even more spice. Plenty of citrus though. There's a fruitiness here, but it's more mature and robust than its younger siblings. Finish: Long and sherried, on the fruitier side. An interesting mix of virgin, ex-Oloroso and ex-Bourbon casks, peated to 15ppm, and named after the "Ghost Dog" who supposedly haunted the village. Hmmm...not sure about the story, but the whisky sounded interesting! Nose: Oranges, slight peatiness, but quite floral and with clear notes of coconut. 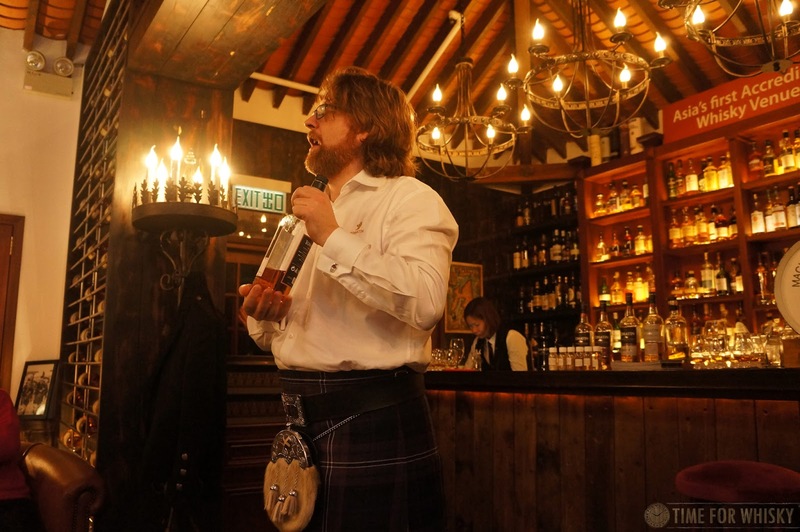 Palate: The peat is there, but subtle, and fruity! Tropical fruits - passionfruit and whipped cream. 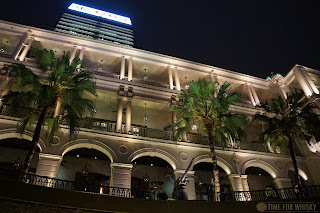 Light, but lovely. The level of peat feels just right. Finish: A slightly earthy smokiness with some oranges rounding it out. Medium length. Rating (on my very non-scientific scale): 93/100. Enjoyed this one a lot. Apparently the last bottle from a single cask bottled for "MacAlabur" - which as best we can work out is a whisky club either based in the US, or Denmark. Nose: Beautiful. Custard, coconut, creamy caramel. A slight earthiness. Passionfruit. Overall quite tropical! A few drops of water adds some nice floral notes. Palate: Big sweet bourbon spice. BBQ sauce. Meaty! Water amps everything up, and adds even more sweetness. Finish: Short to medium in length. Spicy, cream, sweet vanilla. Some residual smoke towards the end. 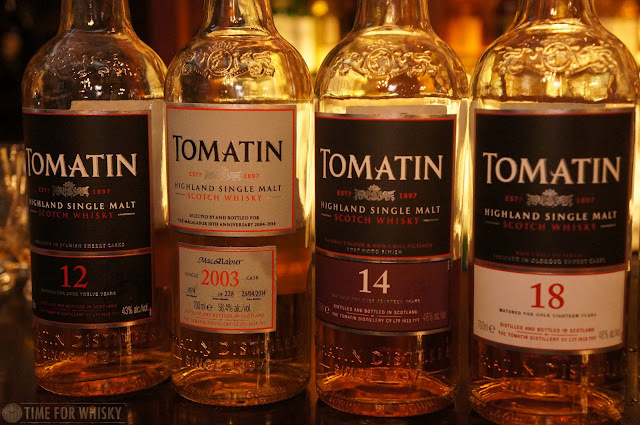 After six drams - all very different but all with a common "light, soft, fruity" theme - it was fair to say Tomatin was no longer an "unknown", but rather a distillery from which we'd happily seek our further expression to try. 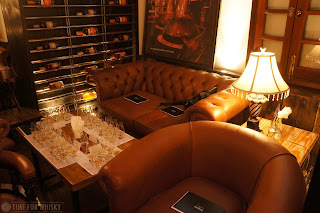 TimeforWhisky.com would like to thank Graham and T'z Limited Hong Kong for the invitation.